Toronto's CN Tower as seen from Centre Island during sunset. Get ready to lace up those sneakers Toronto! 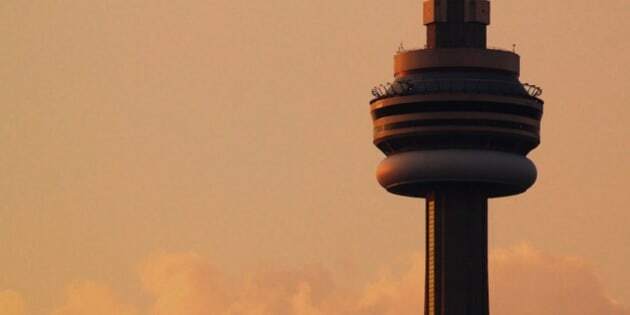 This weekend marks the 25th anniversary of the World Wildlife Fund sponsored CN Tower climb. It is one of two annually sponsored climbs held at the iconic tower. Each year the WWF climb brings thousands of locals and tourists to the CN Tour in a fundraising effort for earth and animal conservation. Experts say stair-climbing is a great workout, it improves cardiovascular health and is low impact, Best Health Magazine reports. This also means you don't have to wait around for a challenge to feel the burn. Try climbing stairs on a machine at your gym or even at your office building or residence. But if climbing the stairs at work seems challenging, taking on one of the world's tallest towers is sure to be intimidating too. To help fight those fears we're answering the 25 things that are top of mind for first timers. And remember when it comes to climbing,just take it one step at a time.